Follow these directions to export bookmarks from the Safari web browser. 2. 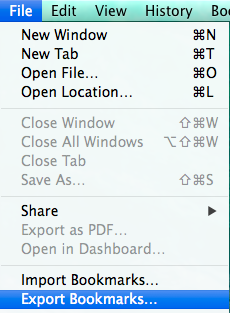 From the "File" menu, choose "Export Bookmarks"
2. Choose a location and select "Save"
Note : To restore your bookmarks, select "Import Bookmarks" from the "File" menu and navigate to the file that you previously saved.